A week before when Rohan kini posted a thread on BBC, instantaneously I decided I am going to be there for the ride. That moment I was not very sure how I will be riding? That thread was getting a good momentum and shown all the signs of going to be an exciting ride. Around this time Sanjay called me and told he is going to get a tandem bike. He will be the lead rider and I will be a co-rider as I don't have to do much except pedalling. As one hand is on cast it is not that necessary to hold the handle because all the control and managing the bike will be done by Sanjay. As we start pedalling after 50 mtrs we need to take a left turn. That first turn was like, driving the truck on an uphill, we were on the edge of the curve. One side it is on coming traffic and the other side is steep valley. What we were focusing is not on taking the turn, but making sure we don't end up in valley. That was our state while taking that turn. It is a long bike compared to regular bikes. No gears. Sanjay is weighing 78 kgs, me 59 kgs and bike is around 20 kgs, makes it 157 kgs. That makes it a huge amount of weight to manage. Add to that at this moment I was holding the bike in one hand as tightly as possible to the extent of kind of influencing the bike to lean that side. To neutral it Sanjay needed to waste a lot of energy. We manage the turns without falling. Next one was a right turn. Before reaching that turn needed to encounter a road hump. Got to be lot more show while going over the road hump. Because front crank would touch the hump. At the next turn we were taking such a slow turn after the turn the car guy who was trying to over take us yelled at is and went. We were taking the complete road to take turns. 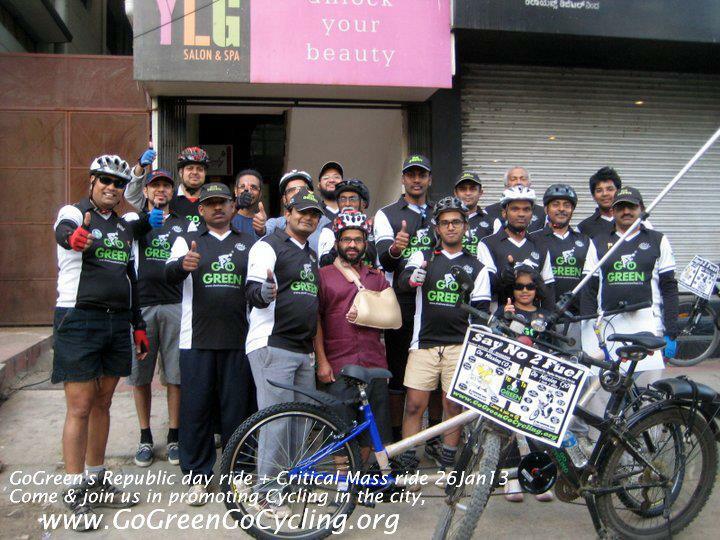 We reached RIS junction where other Go Green riders were reaching that place from different areas. 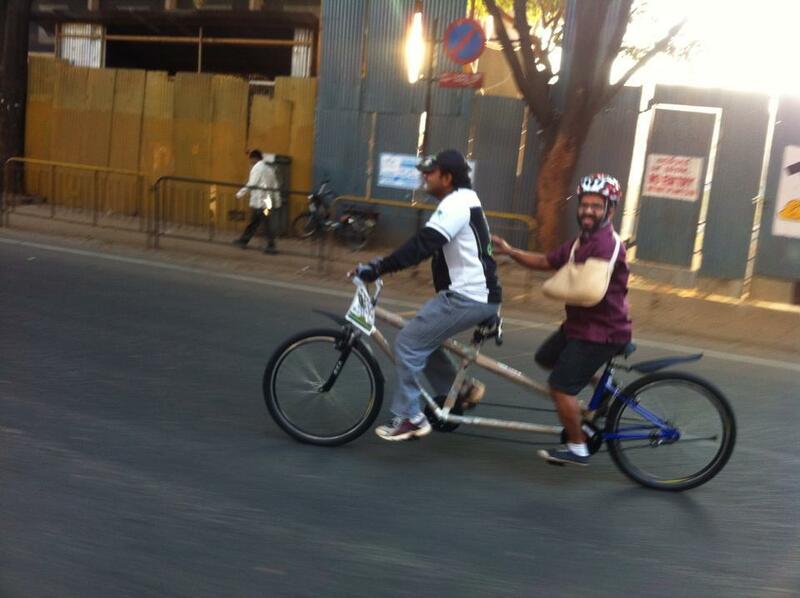 It is around 2.5 kms from Rao's house, Couple of Bikers tested tandem. I met Dr. Ali and he shared his Blr - Puna bicycle ride experiences. There I also spoke to Janardhan sir who has returned after his SCMM in Mumbai. He has completed 42 kms in 7 hrs that was an awesome timing for a 81 years ever energetic young gentleman. Meeting them is so enriching experience. After a photo shoot we took off and head towards cubbon park. Samarth Kapse rode with us all the time and guarded us against some one taking some sudden turns and cuts. By this time both were getting the grip of it, I was not holding the handle bar and allowing Sanjay to handle better. Trying to synchronize with Sanjay's pedaling making the braking easier and saving on energy. Cross roads and signal were bit of a concern however we were learning the art very fast. 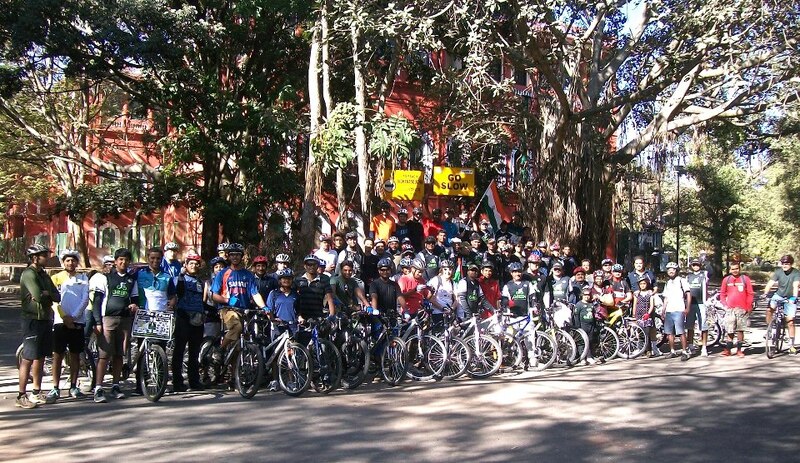 By 8 am we reached Cubbon park, got a warm welcome, lot of familiar faces, tandem bike, casting got the attention of the eyes. By this time Sanjay was little exhausted he had worked in the night shift previous day, came to this ride without a sleep. We decided to skip the ride and wait for the guys to come back. I didn't want to push him knowing it was really tough to do that without sleep, breakfast and on a tandem. 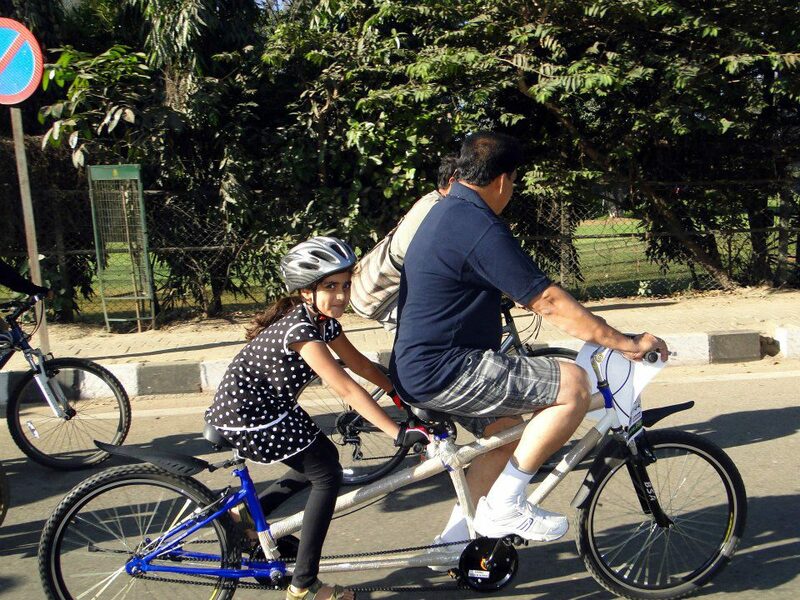 Swapped the bike to his friend Sheshagiri and his daughter Nitya (8 years). They have come from vv puram, Nitya had taken 3 breaks (water break) to reach Cubbon park, told her father. Brightness in her eyes after riding the tandem in Cubbon park can lit enough light for a highways night ride. 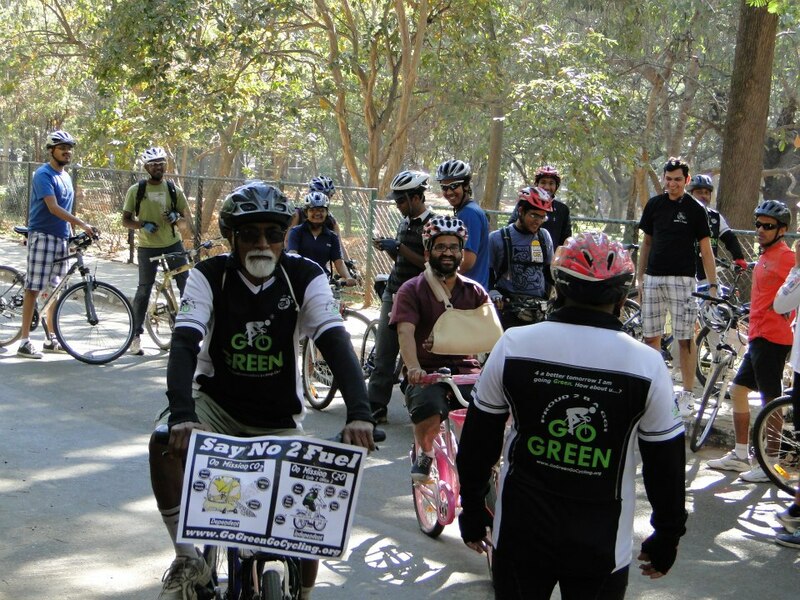 Critical Mass ride took off at 8.10 am, after Satish Vangal spoke for few minutes. Satish Vangal was leading the CM rides then and back to taking the initiative now for the same. Who was in the USA and part of CM rides there also. This is what, Satish Vangal, has to say on FB, "A beautiful morning for leisurely 14 kms ride through what is still a very green city with around 75 riders for a revived Critical Mass Bangalore. Lots of smiling policemen, orderly riding in a single lane, and lots of experienced city riders, including a bunch from the Bangalore Bicycling Club and Go Green group. Let's double the numbers for the next month". 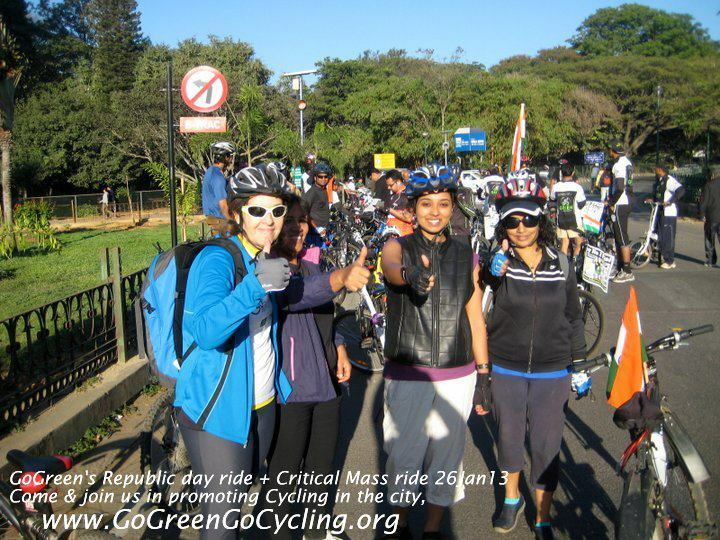 As Go Green Rao and Go Green has whole heartedly supported these rides it can only double in the coming days. He goes on to say, "Critical Mass! Happens in 300 cities world wide last friday or Sat/Sun of every month. Different groups/individuals all come together to take back streets and show that cycles can be part of traffic too. Slow ride 10 years old to 60+ !". Today we had 8 years old to 80 years. Would like to mention few riders with whom i interacted, Ravindra, Krishna Chand, Saurab, Promise, Yash, Ashwin pal, Srikanth Gururaj, Shanth Kumar andAbhinandan (please excuse if i have left out any names). I thank everyone who were part of this ride, Rohan Kini for starting it again, Satish Vangal to leading it and Go Green Rao for joining hands. 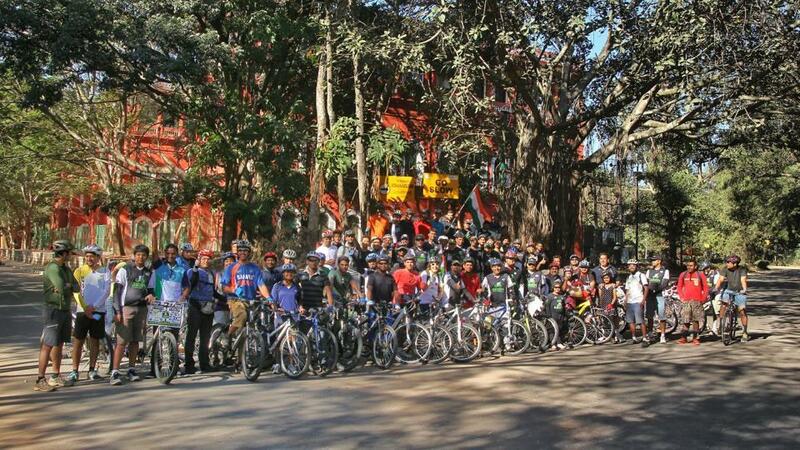 By 9.15 am they all returned to the starting point (Press club - Cubbon Park). With a photo session of the entire group it was declared new era in Critical Mass rides. Signed off in style by singing National Anthem. After speaking for few minutes with fellow bikers, shook hands and we all left. After seeing excitement in Nitya's eyes, dip in Sanjay's energy and guilt in me for pushing Sanjay, we decided to swap Nitya's bike. Nitya riding tandem with Sanjay and I riding her bike to reach back home. 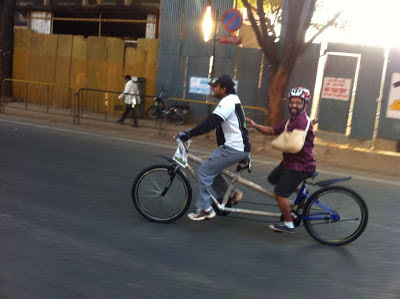 Sanjay was very comfortable riding tandem now. Krishna Mohan, Sheshagiri, Nitya, Sudharshan, Samarth we all rode together after the breakfast we all dispersed in different direction. We felt tandem bike is not good for 2 adults. I was riding her bike and that comes with a back rest, due to that I was finding it very comfortable to ride. As I reached house my daughter was bit of restless waiting for me. It was her 5th year birthday, I chose to be part of CM ride instead of wishing her, as a first thing in the morning, am sure she will appreciate this few years down the line!!!! Thank you Ram, wish you join next month. Thank you Promise Gangani and also for the wonderful photos. Thank you Babusheakr, yes i too, do you want me to remind next time? Thank you Prakash, i miss my cycling so much, difficult to resist. Thank you Madhavan, me too, will meet next time, i missed talking to you. Thank you Sanjay, hehe, absolutely no doubt. Thank you Mohan, sure love to be there. Thank you Jayaprakash, oh yah that will be a good compensation for missing the previous ride. nice write up Anil! Had to give this a miss since i was participating in Brevet 400. I'm really looking forward for the next CM. Thank you, appreciate you taking time to read this blog post.